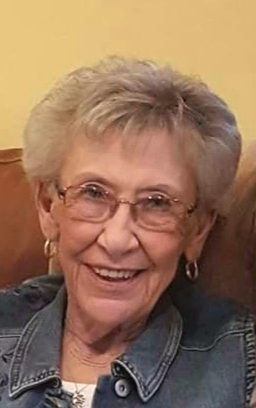 Donna Mae Schmidt Venenga Matheson, 87, of Sun Prairie, WI, formerly of Reinbeck, IA, passed away on Thursday, February 7, 2019 at Meriter Hospital in Madison, WI. Visitation will be held at the Union Congregational United Church of Christ in Reinbeck, on Saturday, February 16, 2019 from 10:00 a.m. until time of funeral service at 11:00 a.m. Burial will follow at Reinbeck Cemetery. Memorials may be directed to the family. Donna was born in Reinbeck, IA, on August 29, 1931, the daughter of Emil T. Schmidt & Hannah Petersen Schmidt. She graduated from Reinbeck High School in 1949. She married Lester Venenga November 6, 1949 and settled on a farm NE of Grundy Center, IA and later moved to Reinbeck IA. They were the parents of two children, Janelle (Randy) LaBounty of St. Louis, MO and Jay (Pam) Venenga of Sun Prairie, WI. After Lester passed away, Donna later married Robert Matheson from Toledo, IA and they moved to Jefferson, IA where Robert was the commercial manager of Iowa Electric. In June of 2017 they moved to Sun Prairie, WI to be closer to family. Robert passed away on August 12, 2017. Donna worked at Iowa Electric for 15 years in Reinbeck, IA and later at Home State Bank in Jefferson, IA. Donna enjoyed being a member of the United Methodist Church and being involved with the United Methodist Women, Culture Club, Jefferson Does and the Order of Eastern Stars where she was a past matron. Donna was always very active, enjoying winters in Arizona and spending time with family. She loved playing cards, cards and more cards! An avid book reader, she loved her book clubs. But nothing compared to the time she spent with her family! Donna is survived by her children Janelle (Randy) LaBounty and Jay (Pam) Venenga; step-daughter Connie (Bill) Smith; grandchildren Brad (Alissa) Venenga, Jadi Leisen, Shelby (Ryan) Spiess, Tyler (Clare) Venenga, Leslie (Peter) Merzian, Michelle LaBounty & Robyn LaBounty; great-grandchildren Haiden & Adyson Leisen; step-grandchildren Amber Matheson, Robert Smith, Chris (Bailey) Smith and several nieces & nephews. She was preceded in death by her parents; first husband Lester Venenga; second husband Robert Matheson; 4 brothers, Clarence, Vertus, Leon & Wayne; sister Florence and a stepson Doug Matheson.